Happy Friday everyone. Today I'd like to share with you my experience with Nail Pattern Boldness Glitter A-Peel. This is a product that I have been wanting to try for a very long time. Finally, at the beginning of this month, I ordered a bottle. I don't regret it one bit! For those of you who have followed my facebook page for any length of time may have noticed that I don't tend to wear polishes with a lot of glitter in them. To be completely honest I love the look of these polishes but not enough to deal with the removal process. Until recently that is. I started to notice a few months back that I wasn't getting as excited about the brand name polishes anymore. It seemed like I couldn't find anything new to add to my collection. I started looking at more indie polishes, picked up a few here and there. I'd wear them and dread the removal. I knew it was time to get my hands on a good peel off base coat. I used a gorgeous glitter bomb polish from Lacquistry called Moonlit Marina as my test polish. You can find photos and my thoughts about it in this post. I used a thin coat of Glitter A-Peel 2 coats of Moonlit Marina and 2 layers of topcoat for my manicure. Finally, after 3 days of perfect wear, I was ready for a manicure change. I used a rubber cuticle pusher to gently lift off my polish around my cuticles and here's what happened. I even had the polish on one nail just pop off on its own while I was removing my manicure. Unfortunately not every nail came off this easily but it was still a lot easier than the foil method. Please excuse what looks like dry ragged cuticles. It's actually some remnants of the manicure that was a little stubborn. I wanted to take a during photo to show you my truest results. One swipe with remover at the end cleaned that up nicely. I have a feeling if I'd used a slightly thicker layer as my base all 10 nails would have removed as a single piece. And I'm going to test that theory out in the next few days. Overall I am very happy with the result that I got and wish I would have picked up a bottle sooner. I can't wait to wear all the new pretty polishes that I've purchased and then neglected because I didn't want to bother with the removal. Be on the lookout for those polishes to make an appearance on my blog soon. Hello there everyone and Happy Monday. 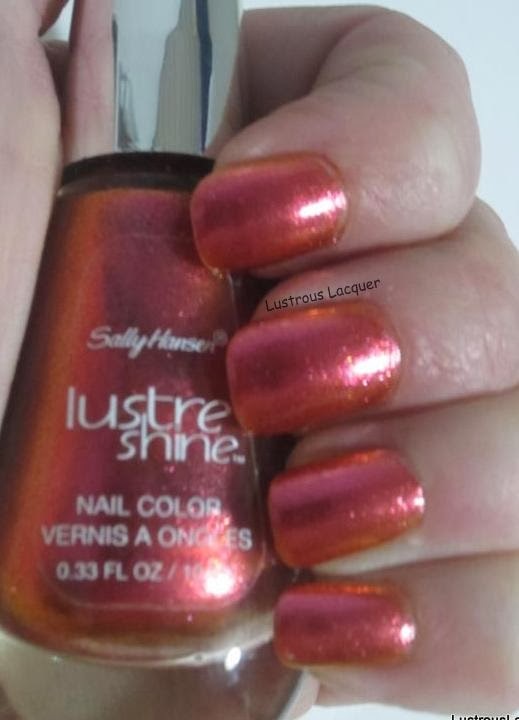 Today I want to talk about Metallic finish nail polish. 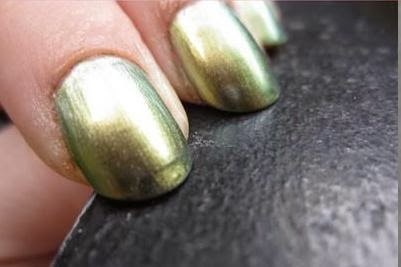 Some characteristics of metallic nail polish are that they make your nails look like metal and have a smooth almost mirror like finish. The most popular colors are copper, gold, and silver but over the last few years, we have seen companies branching out into other colors. For example, Essie's Mirror Metallic collection contained a blue. You can find my review of the entire Mirror Metallics collection here. Foil finishes are often confused for a metallic finish because they have a similar appearance. However, foils contain micro glitters to give them a metallic feel but true metallic finishes contain no glitter. Unfortunately, some downsides to the metallic finish are that they leave brushstrokes and tend to show every imperfection on your nails. One way to help prevent this is to use a good ridge filling base coat and either a thick layer of top coat or two thin layers. I hope you've enjoyed this post. If you'd like to read earlier posts in this series just click on the "what's in a finish" tag below. Happy Polishing! A quiet moonlit night with the moon reflecting on the softly lapping water of a still marina, stars dapple the sky and twinkle down on the dark water. Moonlit Marina is interspersed with color-shifting iridescence amongst dark green and dark blue. Isn't that a fantastic description! As someone who loves spending time outdoors camping and watching the stars twinkle over the lake this polish called to me. I used 2 slightly think coats of Moonlit Marina with 2 layers of Out the Door for a smooth even finish. With a little manipulation, I was able to get almost complete coverage and no fishing for glitters was required. I wish I had been able to really capture the sparkle this polish has better. My fingertips really do twinkle like stars in the night sky as move them across the keyboard. And why wouldn't they? Just look at all the different sized glitters this polish has. Before the rain and snow started I was able to snap a few pictures outside. While there wasn't any sunshine to help me out, I feel like natural light should be taken advantage of whenever possible. With the way this winter has gone those chances have been very few and extremely far between. If you'd like to pick up your own bottle of Moonlit Marina you can pick one up here but be quick because as I'm writing this post there is only 1 bottle available. And to keep up with all the news from Lacuistry Nail polish check out the facebook page. Good morning my fellow lacquer friends. Happy Hump Day! 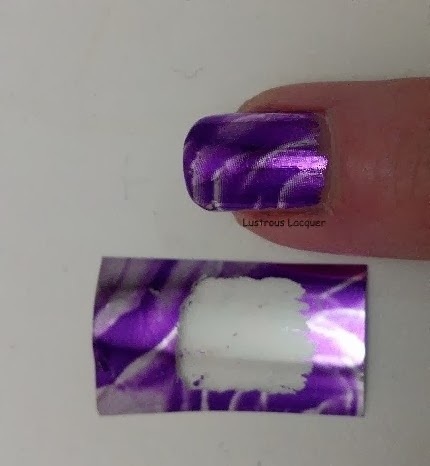 Today's blog post is about my recent experience with nail foils. Oh, how I looked at picture after picture of manicures done with them, Longing to have them on my fingertips. Finally, after a few months, I bit the bullet and purchased a set of them from Dollar Nail Art. My order arrived and I was all excited about them. And then they sat there daunting me, teasing me, daring me to use them. You know the term "you are your own worst critic"? Well, I am my own biggest naysayer and trying something new, especially when I share my attempts with the world scares me a little. It's something that I'm working on so I watched a YouTube video for some tips and jumped right in. I always feel more prepared and indestructible after watching a few videos on how to do something. Anyone else ever feel that way? So after learning that patience is a virtue once again I finally got my first foil applied successfully. It's not perfect but I loved it! At first, I was only going to do an accent nail for my manicure but how could I resist a full manicure of this gorgeousness! So with limited time before work I set out to do just that. The end result is a little bit shady as there is a slight learning curve to nail foils but I was determined! So this is where the love/hate relationship comes in. I love how this looks. ( Have I said that enough in this post?) But I had a few bald spots on my nails that I couldn't fix. Plus you cant top coat them. When I tried to top coat them they got ruined. 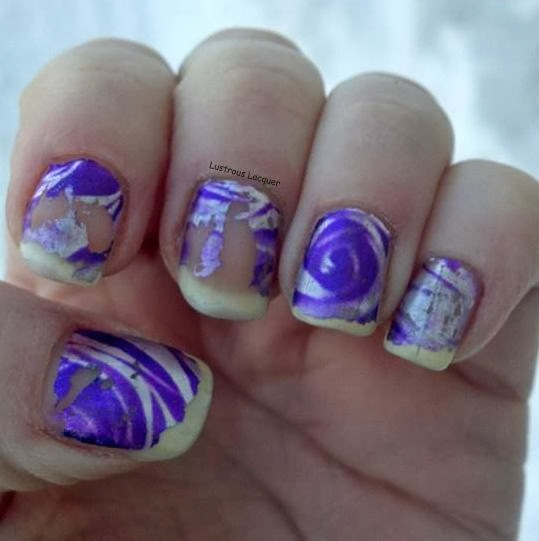 The foil almost crumpled up on my nails. Here's the kicker. Once you have your foils applied don't move, don't apply lotion, stick your hands in your pockets, wash your hands, or just generally touch anything. If you do this is what you'll end up with. Nail foils are extremely fragile and delicate. This was just 2 hrs into my shift at work. I felt so embarrassed to have my nails looking like this. I put gloves on just to hide them and that removed them even faster. By the end of my 8 hr shift, there was nothing left of the foils at all. If anyone has any tips about how to make these last longer I'm all ears. Part of me wonders if a non quick drying top coat would work better but I haven't had time to test this theory yet. I hate to think that I have all these foils that I cant really use. 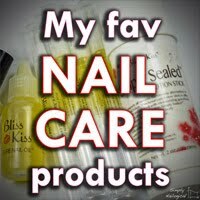 I'd love to hear your thoughts on nail foils or any tips you'd like to share. Thanks for stopping by and Happy Polishing! Also dont forget to check out my 3K giveaway. A few months ago I found a top coat that actually works with nail foils. You can find my post and review here. Hi there everyone. Sorry about being absent last week. But I have a good reason. I was busy getting things together for my best giveaway yet! As most of you know I recently hit 3000 likes on facebook and I wanted to do something big to celebrate. I won't bore you with a long rambling post because after all, its all about the polish! I do want to get in a quick THANK YOU to everyone who took the time to click that little like button to help me reach this milestone. Now onto the prizes. Unfortunately, this giveaway is open to the U.S only because of shipping issues. I will try to include everyone else in the next giveaway. Prize Pack 1 is the Glitz and Glam Anniversary Collection from Krafty Gurl Designs. 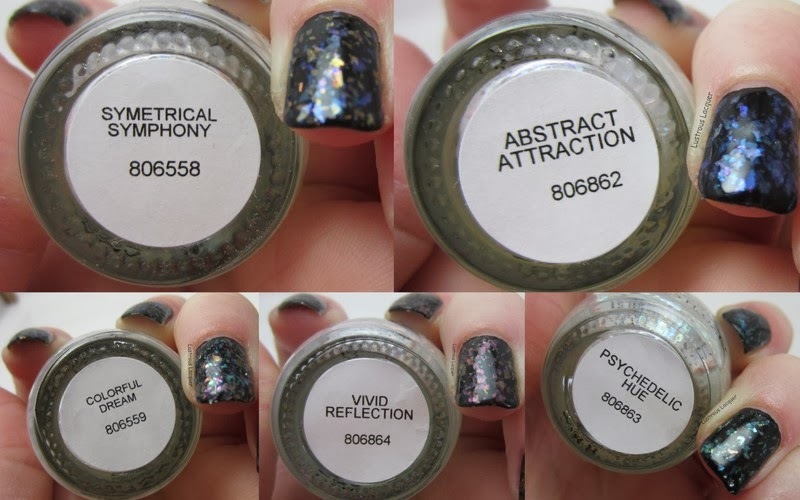 Prize Pack 4: 3 mystery Polishes from LynBDesigns. I will update the post with a pic once the polishes are in my possession. For today's what's in a finish post we have one of my favorite finishes; the holographic. Now as many of you know there are two types of holographic finishes, the linear and scattered. But I've found over the last few months that a lot of people are confused as to what the differences between them are. Let's start with what makes a polish holographic. 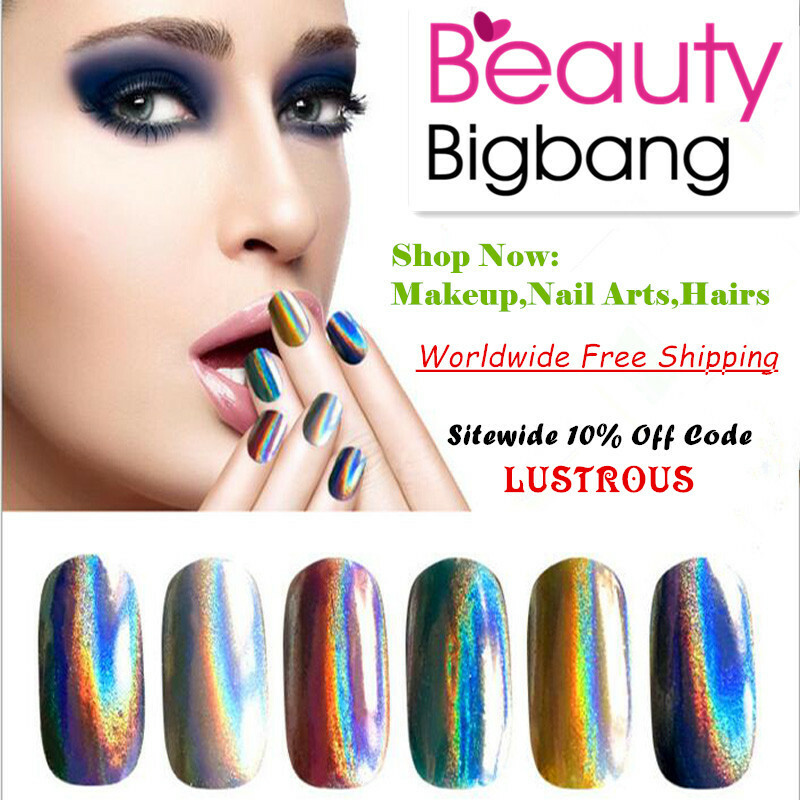 Holographic polishes contain very fine rainbow colored glitters, which change color with the reflection of light. (Also known as spectra flair) This finish is very obvious in sunlight, but many times can be visible indoors. Linear holo's change color with the reflection of light giving off a rainbow effect. Some polishes have a stronger rainbow effect than others depending on the number of glitters in the polish. Now here's a quick photo comparing a linear holo to a scattered. This is 2 coats of Orly Miss Conduct compared to 2 coats of China Glaze Infra Red on a nail wheel. While I like both, the linear holo is my favorite. Back at the beginning of the year, I was lucky enough to win the new Kaleidoscope Collection from Finger Paints. From the moment they arrived at my door, I wanted to get them up on the blog. But I didn't want to do a few here and a few there. Unfortunately, due to time constraints, this post was pushed back a month later than I wanted it to be. Finally, I am able to share these new specialty toppers with you. I apologize right now about this being a very picture heavy post. So let's get to it, shall we? All photos are shown without top coat and are 2 coats unless noted. This collection consists of 6 polishes; 5 flakie top coats and a black polish to use as a base. Let's start out by taking a look at Black Expressionism. I was really impressed with Black Expressionism. It is a true one coat black polish that dries to a high shine. The application was effortless. Shown here is 1 coat without top coat. Psychedelic Hue contains green and blue flakes with flashes of yellow and hints of purple. Here I layered 1 coat of Psychedelic Hue over 1 coat of Black Expressionism. Vivid Reflection had purple and magenta flakes with hints of orange, blue and, green. Vivid Reflection is one of my favorites from this collection because it has different colors than the other flakie polishes I own. The more I look at the one the more I like it. But it's not my absolute favorite. I'm saving that one for last. I'd say this was my second favorite of the bunch. Symetrical Symphony gave me the best coverage out of the entire collection. I'd have to say this is my 3rd favorite of the collection coming in just behind Vivid Reflection. Colorful Dream certainly lives up to its name, with flakes the color of a pastel rainbow. The colors; while being on the pastel side still manage to pack a punch as they catch the light. 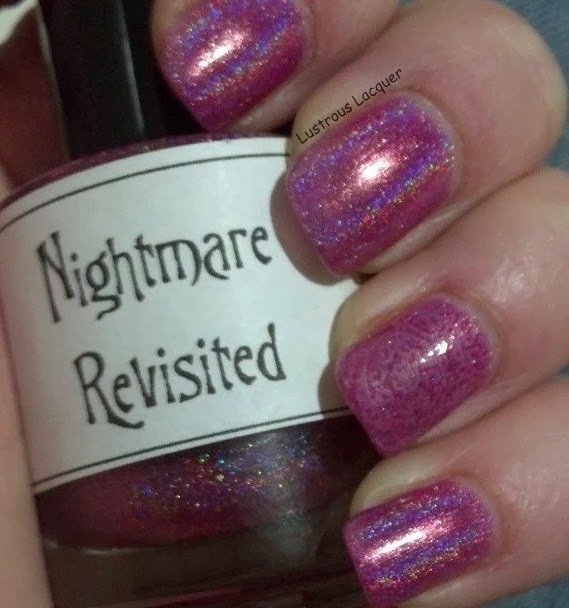 If you're looking for a topper that goes with everything I say Colorful Dream is the one you want. Abstract Attraction turned out to be my surprise favorite of the collection with it's deep blue, aqua and purple flakes. I like how deep the colors are in Abstract Attraction. The contrast isn't as intense as the others but it still makes an impact. Did Finger Paints find a way to cure my desire to own the original 2012 flakie collection? I wouldn't say that exactly. While this collection is fun and different it's not as vibrant and has me still wanting to get my hands on the 2012 set. I do like that the base has remained clear so far instead of yellowing like the previous collection though. I'd say the Kaleidoscope collection is a toned down version of the original. The Kaleidoscope collection is now on shelves at Sally Beauty Supply if you'd like to get them for yourself. Even if you're not impressed with the entire collection I would still seriously consider getting Black Expressionism. I can't wait to see how well it stamps! If you've made it this far in my post I want to thank you for sticking with me through another long one. I promise to wait awhile before I throw another one of these at you. Id love to hear your thoughts about this collection vs. the 2012 version. Thanks for stopping by and Happy Polishing!